With Grace Millinery is widely respected for their high quality and unique pieces at affordable prices. We interviewed With Grace Millinery Owner Maria Benck. Your millinery style is bold and beautiful. What influences and inspires you? My love of fashion is what inspired me to start designing fashion headwear. Whilst I like to keep my creations on a feminine scale, it is with colours, texture and shapes that are the driving force behind my design inspirations. Working with new materials can be so exciting and so rewarding as you get to see them evolve and really then become a work of art. Tell us about your training. How did you become so talented? I have always had an artistic and creative streak within me, where my employment history stemmed from a hairdressing background for the past 30 years. I also then worked in the Fashion industry where I would help style beautiful ladies in their need for an outfit for special events. I began by making my own pieces for special race days and then was approached to make for many others which then led me to take my fashion and creativity to another and exciting path. I found myself creating for other fashionable fillies where then "With Grace Millinery" flourished. I have completed online courses that have helped to reinforce my natural creative ability; however, most of my designs were self-taught. I have also been blessed to be around many talented Milliner friends in the industry, who have also supported and guided me throughout this amazing journey. It has also been so rewarding to have had many of my designs win Fashions on the Field (FOTF) and best millinery awards. Not only have these experiences been so wonderful I have also been so blessed to make so many new friends along the way. Do you prefer when clients show you their outfits and say please create something for this. Or your clients to say I want this, this and this for this date. Whilst I like clients that have a clear vision of what they would designed, I also enjoy having the flexibility to create and not be limited to a certain style and colour. The majority of my clients are happy for me to use my creative flair depending on the style of their dress and event that they are attending. 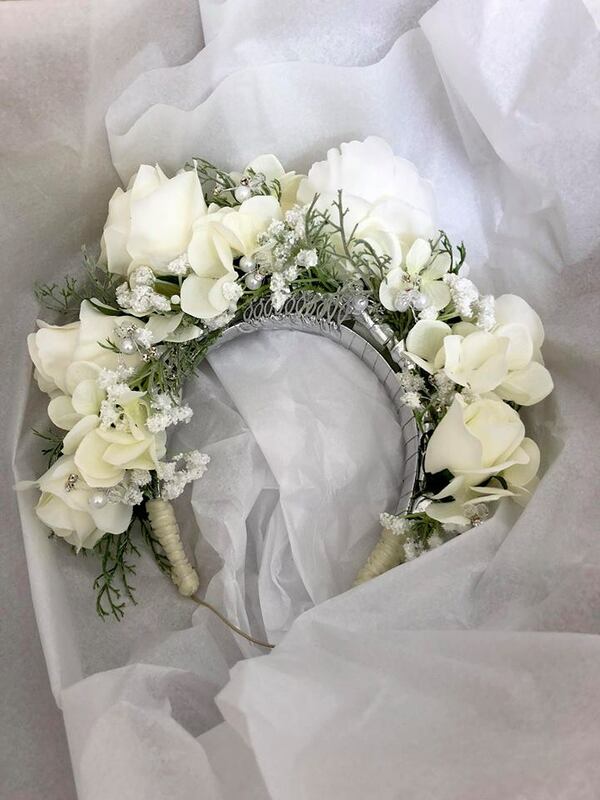 My work has been creating race wear fascinators; however, I have also designed headwear for brides, engagements, and baby showers (using fresh flowers) All so challenging yet rewarding. What are your millinery style predictions for 2018. Millinery is an industry that continually evolves, changing with each season and is dictated by fashion. Bright colours, large brimmed hats and boaters are still in current style. Halos, Turbans and Flower crowns are still making a strong presence however, I predict that different shapes and bright colour combinations will become more prominent throughout the year. Fascinators are only limited to your imagination. The skies the limit!